The 44th running of the Elk River Valley was a success. As far as we know everyone enjoyed the routes (12,52 and 75 miles) and no one was hurt. However, Mica Jon was “tackled” by a playful black lab and went down; he says he is fine but his bike was injured pretty badly. 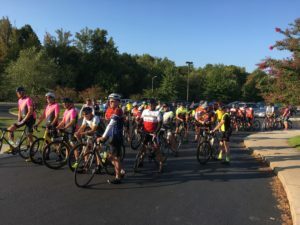 There were around 65 riders for the September 9th ride. In addition to HRBike members, there was a huge contingent from the Murfreesboro Bike Club, a few Veloteers’, several from the Columbia Bike Club and one or two from other clubs. Due to the way the registration was managed, we also have several new members: 4 families and 9 individuals. The combination of HRBike memberships and sale of HRBike merchandise helped us to come out in the black. On returning to West Middle after the ride, the cyclists said they had fun. Just about everyone came in telling us they loved the route, and several told us they stopped mid-route for coffee and a visit. Also, many of the cyclists that rode together had lunch here in Tullahoma before heading home. Special thanks to West Middle School and Principal Mick Shuran for allowing us use of West Middle for the event. Also, thanks to Chris Barstad for the LightTUBe TV spot, which brought in several local riders. Thanks to Tim Harrison for the website and for marking the roads, and to Paul Schwer, Tim Harrison and Grady Wells for putting together the routes. The day was beautiful, the routes were great, the cyclists had fun, and the organizers considered this year’s event very low stress. That equals success in our minds; hope you agree. This entry was posted in Current Events, Reviews, Ride Reports, The Right Side of the Road and tagged 2017, ERV, Rides on September 17, 2017 by juliah.